Analogue or Digital – Which Soldering Iron To Choose? One of the common confusions people have is about deciding whether to go for an analogue soldering iron or digital one? Let’s quickly discuss the core differences between these two types of soldering irons. Analogue type of soldering irons exist since long time. Basically, in analogue soldering guns(irons), user doesn’t get to see the temperature level that is the soldering iron currently is at. While doing a solder, its extremely important that you apply right amount of heat to the objects being soldered. An excess heat can mess up the whole thing and can even damage the components. However, an experienced soldering technician can judge the heat level by his skills. 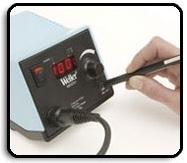 Digital type of soldering guns(Stations), have a feature that display the temperature of soldering iron. User can look at current temperature and if he want a specific temperature, he can always set the temperature using the controls provided. No more dependency on expert judgment. Which one to Choose? – Analogue or digital? Since digital soldering irons come with added convenience of allowing user to see the temperature level and offer adjustment controls, they tend to be little expensive when compared to analogue soldering irons. However, in recent days, digital soldering stations are fast replacing the analogue ones especially where serious soldering work needed to be done.